Get it?! M. Night Shyamalan! What a twist! Haha! Isn’t that Reaper so adorable? Here we are, finally at the end of our marathon. Day 5. It’s been a long week, full of ups and downs, punching Jacob in the face, and not actually playing Mass Effect 3 because we’ve been spending all of out time on these comics. I don’t think this goes the same for Jacob, but I’m excited to beat ME3, even though the internet is telling me I’m going to hate myself for wasting the 12-20 hours to beat this game. I think it’s important to note, we’ve spent 15 panels with these three board members, and only recently gave them names. The red head is Richard. The old man is Bart, but you can call him Bartholomew. And the Executive man is Brad. You have to understand, we were not prepared for this week at all. 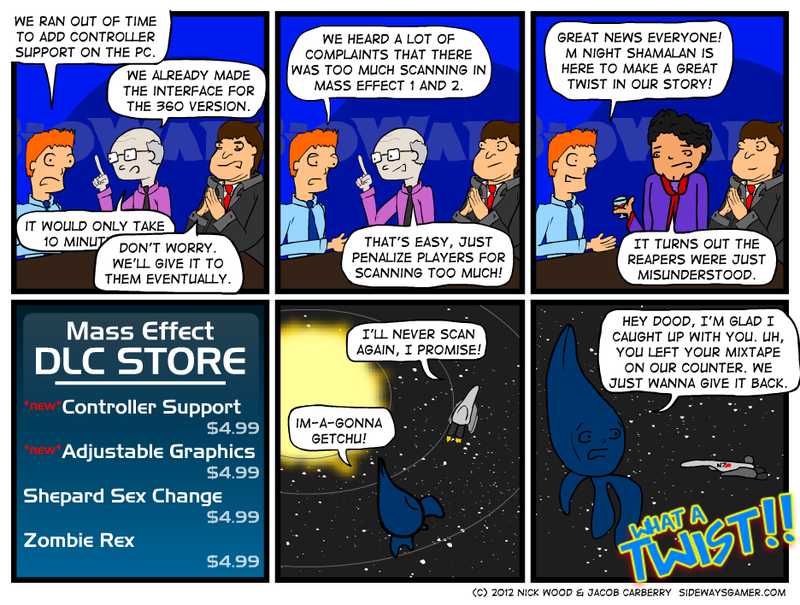 After Thursday’s comic, Jacob decided he liked the comic so much, and there was so much wrong with Mass Effect to make fun of, we should do 3 comics; one on Sunday, one on Tuesday, and one on Thursday. But I didn’t like that schedule. So he thought maybe we could to four; Sunday, Tuesday, Thursday, and Saturday (I think) but that’s a dumb number. So he kept coming up with things he didn’t like, and here we are. Friday. The last day.